What, really, is a chess combination? It is a maneuver generally employing surprise and a sacrifice, in which pieces work together to bring about a sudden advantage. It is perhaps the most aesthetically satisfying and successful technique in the game. Some players believe that the combination is a spontaneous creation with no guiding laws; the possibility springs up in the mind like a flash of genius. 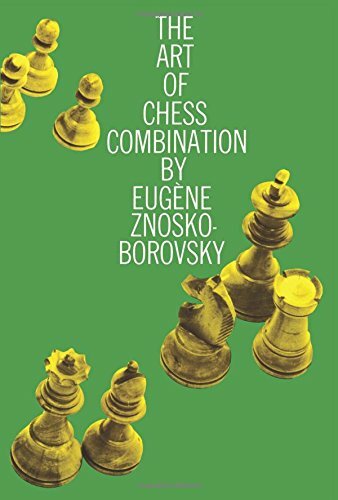 In this classic work, however, Znosko-Borovsky proves that combinations can be studied. He demonstrates conclusively that they need not be a haphazard occurrence, but may be prepared for as an integral part of a player's game. The great modern teacher begins by examining the games of master players, including Capablanca, Alekhine, Rubinstein, Nimzovich, Tarrasch, Reti, Mason, Morphy, Bird, Euwe, Emanuel Lasker, etc. The games are grouped according to common features, and perceptively analyzed to determine what conclusions may be drawn. Znosko-Borovsky shows that every combination, however complicated, begins in a simple idea, such as an undefended piece, the bad position of the hostile king, the promotion of a pawn, or a discovered check. The Art of Chess Combination will improve the game of anyone who knows how to move individual pieces but finds it hard to plan many moves ahead to make the pieces work together. The exposition is easily understood; technical terms are almost completely avoided but clarity and precision remain.